Depression is defined as a low mood that persists over a long period of time، affecting every aspect of everyday life، daily mail reported. Mild cases of depression may not stop you leading a normal life، but low spirit can make everyday activities more challenging and less worthwhile. More severely، depression can be life-threatening and leave people feeling helpless، suicidal and losing the will and strength to live. This condition is hugely complex and characterized by many different factors. While making healthy diet and lifestyle choices is certainly not going to cure or prevent depression، findings from a recent study carried out by Manchester University have added weight to the evidence that adopting healthy habits may improve the symptoms associated with the condition. With over 40 million people in the US struggling with depression، and over two million adults in the UK، many are clamoring for any new information that could help us combat mental health issues. The overall number of adults with depression has not significantly changed recently. However، money troubles، unemployment، health concerns، family difficulties and Brexit worries can make it more difficult to cope. The way that we are managing conditions like depression is worsening، with the numbers of people experiencing suicidal thoughts or self-harming on the rise. Mental health problems drive thousands of people to take their own lives. In the US، suicide is the tenth leading cause of death. In the UK، according to the Office of National Statistics، men under the age of 49 account for 75 percent of suicides - making this the leading cause of death among this group. Can diet and lifestyle choices improve the condition? Making simple dietary changes does appear to improve the symptoms of depression according to the findings from a recent study carried out by researchers at the University of Manchester. The study analyzed data from 16 clinical trials examining the effects of dietary interventions on symptoms of depression and anxiety. The research، which included data from almost 46،000 people found that weight loss، nutrient boosting and fat reducing diets all helped to improve mood and reduce the symptoms of depression even in people without diagnosed depressive disorders. Up until now، previous studies have been unable to definitively establish whether or not dietary improvement could benefit mental health. The study also found that all types of dietary improvement had equal effects on mental health، suggesting that highly-specific or specialized diet were unnecessary for the average individual. Specific dietary changes from the study included eating more nutrient-dense meals rich in fiber and vegetables whilst cutting back on fast-foods and refined sugars، which were shown to be sufficient in avoiding the potentially negative psychological effects of what they called a ‘junk food’ diet. Exercise played a role too as they also showed how combining dietary interventions with physical activity led to a greater improvement in depressive symptoms. In the study it was also shown how women experienced greater benefits from these interventions than men. Researchers also commented on the need to identify how the benefits of a healthier diet on improved physical health may be linked to conditions such as depression، which could be the result of reducing obesity، inflammation or fatigue. How easy is it for people with depression to make these changes to their diet? Making changes to your eating and exercise can be extremely difficult and appear overwhelming if you’re experiencing a mental health condition. Depression itself is characterized by reduced interest in everyday activities، feeling tired on a daily basis، and a diminished ability to think or make decisions. The key to eating better even if you have depression is to create little، gradual changes that become habits. The advantage of habits is that they persist even when motivation and interest desist. Studies show that actions that are simpler become second nature more quickly. The most effective way to make dietary or exercise changes if you have depression is therefore to start with a very small step. Start by making just one meal of the day healthier. If you haven’t exercised in a long time، go for a five-minute walk at the same time every day. Small actions will lead to big gains. How can depression affect appetite? Some low mood disorders can affect appetite، which puts you at risk of not gleaning a full range of nutrients from the diet as well as enough calories to maintain good energy levels. Low intakes of minerals such as iron، selenium، magnesium and vitamins such B12 and folate may also lead to tiredness and fatigue or bouts of insomnia which will all exacerbate the feeling of low mood and depression. However، it can also go the other way as people look for comfort in food، overeating and gaining weight that may reduce self-esteem and confidence as well as bringing about feelings of guilt. Maintaining a healthy diet by eating three balanced meals every day will ensure you get all the key nutrients that help the body to function properly. Prepare meals that include a good source of protein and team this with high-fiber carbohydrates (brown rice، pasta and bread or whole grains)، plenty of vegetables and stick to healthy fats found in foods such as olive oil، nuts، seeds and avocado. You don’t have to cook from scratch as oven-ready meals can receive a nutrition overhaul when you serve them with plenty of veggies (also check the front of pack label for something healthy). Even quick meals such as scrambled eggs on toast are brimming with goodness. Vitamin D is sourced primarily from the sun and low levels have been associated with a type of depression known as seasonal affective disorder (SAD). Light therapy is advised to help with this condition، but you can boost your intake with a few foods such as oily fish، mushrooms and fortified foods، although it is not possible to get everything you need from diet alone. It has been shown that levels of vitamin D are low in most people during the winter months and Public Health England advises we take a supplement to help combat this such as Healthspan Super Strength Vitamin D3. Low blood sugar levels can leave you feeling irritable and unable to concentrate properly so making sure you eat regularly and avoid skipping meals. Opting for fiber-rich carbohydrates such as oats، brown rice and quinoa as well as proteins and healthy fats will lessen the effect on blood sugar levels and maintain fullness. Try and avoid sugary snacks and drinks as these can lead to rapid rises in blood sugar، which may give you an initial boost but likely result in a resultant crash leaving you feeling tired and lethargic as the body releases insulin to drive sugar out of the blood and into cells. This mineral is abundant in the body and has a relaxing effect. Women with insufficient intakes of magnesium have been shown to suffer more with mood disorders associated with PMS. 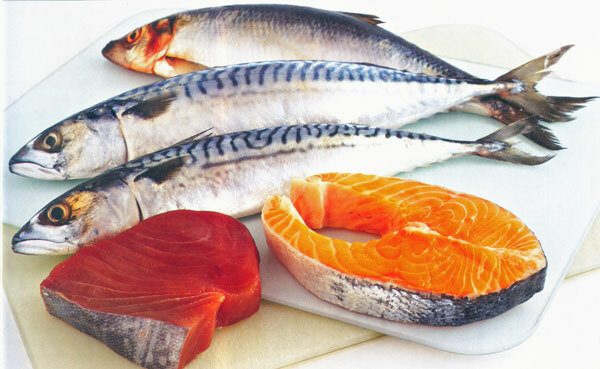 Deficiency is not common but low levels can result in anxiety and tiredness. You can insure a good intake of magnesium by including plenty of foods such as dark green leafy vegetables، seeds، nuts (especially cashews)، raw cacao and dried fruit in your diet. Raw cacao، cocoa power and dark chocolate are not only a good source of magnesium but contain a compound called phenylethylamine، which acts as a mild mood enhancer. 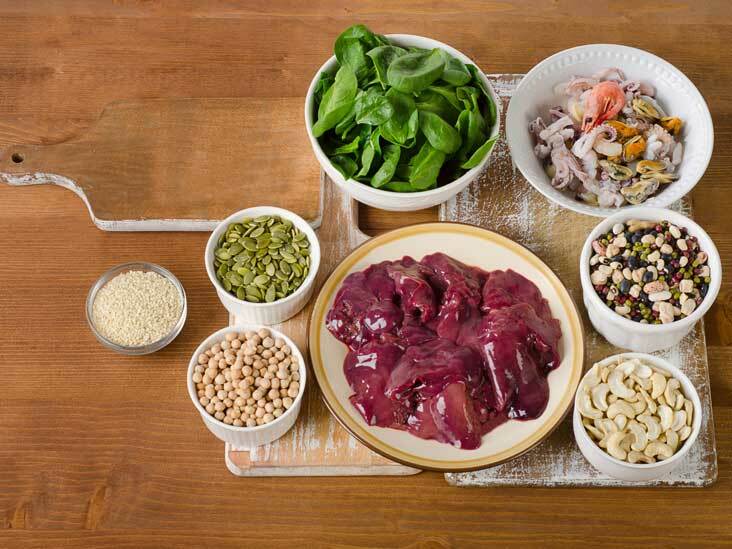 Iron is found in foods such as red meat، oily fish، beans، nut، dark green vegetables and dried fruit. This mineral is involved in the production of red blood cells، which are responsible for carrying oxygen around the body. Iron deficiency is one of the most common nutritional problems worldwide and can cause tiredness، fatigue and contribute to depression. Findings from the National Diet and Nutrition Survey have shown that women are more at risk with 27 percent having low intakes. Serotonin helps to regulate mood and is made in the brain with the help of an essential amino acid called tryptophan، which is found in foods such as poultry، seeds، bananas، oats and soya beans. The uptake of tryptophan into the brain is helped by eating carbohydrates، which stimulate the release of insulin. This hormone helps to reduce the level of other amino acids that compete with it for transport carriers to the brain. Try eating a carbohydrate-rich meal in the evening to help relax the body and encourage sleep.